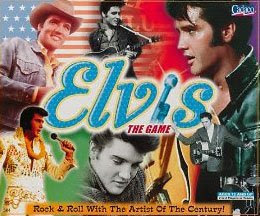 That would have been a good title for this posting: "Elvis the game - It's impossible!" Or maybe "Elvis the game - Not such an easy question!" I have this game. I have wore one out actually and picked up another one in Memphis a few years ago. I agree that some of the questions are pretty hard, but overall I found this somewhat easy. Maybe that is because I have played it so many times. I have not played it in a long time though because no one wants to play. I will say I like it better then the latest addition that came out four or five years ago. It has many questions that have the wrong answers to go along with them. Also I did not like the concept as well. I still enjoy either one when I get the chance to play though. Imagine meeting up in Memphis sometime and, after a visit to Graceland, play the game, maybe over a beer. That would be cool. Man, that would be cool. Let me know next time your in Memphis and I am down. I am always looking for a reason to jump over to the other side of that state and visit Memphis!